Qualtrak Evaluate by Qualtrak Solutions is a high-standard agent evaluation (quality monitoring) and online learning solution. It automatically selects recordings to be used for evaluation purposes by capturing the contact trace records (CTRs) streamed from Amazon Connect, and plays back the recording. An Amazon Kinesis data stream and Kinesis Data Firehose delivery stream that sends CTRs to an Amazon Elasticsearch Service (Amazon ES) domain. An Amazon ES domain used to store and search all CTRs. An Amazon Elastic Compute Cloud (Amazon EC2) instance running Windows Server 2016 R2 to host the Qualtrak Evaluate web application. The instance is created from an Amazon Machine Image (AMI) listed in AWS Marketplace. A Microsoft SQL Server Express Edition on Amazon Relational Database Service (Amazon RDS) instance used as the primary data repository for the Qualtrak Evaluate web application. An Amazon Simple Storage Service (Amazon S3) bucket used to store and share all attachments that supervisors include during their evaluation. You can choose from three deployment options, depending on whether you already have a virtual private cloud (VPC) and data streaming set up on AWS. 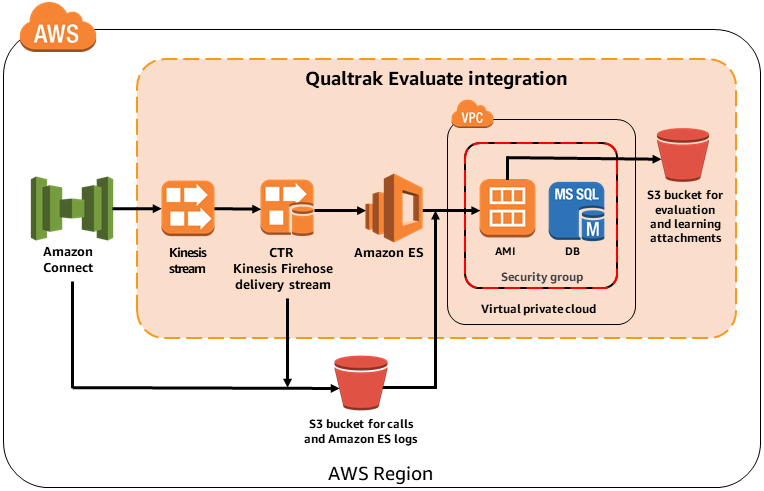 This Quick Start was developed by Qualtrak Solutions in collaboration with AWS. Qualtrak Solutions is an APN Partner. Step 2 Get a subscription to Qualtrak Evaluate. Step 3 Create a new Amazon Connect instance for the integration, or use an existing instance. - Option 1: Creates a new VPC, deploys the AWS components for data streaming, and then deploys Qualtrak Evaluate. - Option 2: Uses your existing, properly configured VPC to deploy the data streaming and Qualtrak Evaluate components. - Option 3: Deploys Qualtrak Evaluate only. Use this option if you have already deployed the data streaming integration. Complete the parameter fields. This integration is currently supported in four AWS Regions: US East (N. Virginia), US West (Oregon), EU (Frankfurt), Asia Pacific (Sydney). Step 5 Configure the integration. Follow the steps in the Qualtrak documentation to complete configuration tasks.